What a stunning campaign and an interesting casting choice. Cavalli partnered certified supers Naomi Campbell, Karen Elson and Kristen McMenamy with rising star Daphne Groeneveld. Placing the 17 year old amongst such esteemed company is a big statement. This is one of my favourite campaigns of the season, what do you think of it? I’m a big fan of this Tom Ford shot campaign, as usual it’s so visually rich and sumptuous. I’m pleased to see a model I spotted years ago in the campaign too, Mirte Maas looks absolutely beautiful with male model Mathias Bergh. The expressions and smiles are a very welcome break from the vacant faces we usually see in campaigns. Moschino and Belstaff come to London. Great news for the London Fashion Week roster, British heritage brand Belstaff are returning to the schedule after a three year haitus and Moschino’s Cheap & Chic label are leaving Milan to show in London. I’m glad to see that London isn’t losing it’s growing momentum, despite all of the scheduling issues between itself, New York, Milan and Paris. The “Louis Vuitton – Marc Jacobs” exhibit. The Musee des Arts Decoratifs at The Louvre is set to become home to a duel exhibit celebrating Marc Jacobs’ 15 years at the helm of Louis Vuitton. Opening on 15th March, the same night of Louis Vuitton’s AW12 show, the exhibition will take up two floors – one dedicated to the late Louis Vuitton’s designs and one full of Jacobs’ designs. One not to be missed. More Parisian based news. Word on the street is French footwear designer Christian Louboutin is releasing a collaboration with infamous Parisian cabaret Crazy Horse. Intrigued is not the word, cannot wait to see pictures of this collaboration. 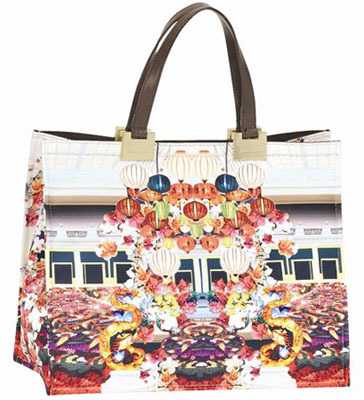 Imagine how jaw-droppingly beayutiful Mary Katrantzou’s signature digital prints would look on a bag. The guys at Longchamp did just that and went one better, made our dreams reality. The “East meets West” theme includes paper lanterns, dragons and elegant Asian architecture making for an unmissable combination. The collection launches in Colette on 23rd January. Taylor Tomasi Hill for Lane Crawford. Ex Teen Vogue and Marie Claire accessories director Taylor Tomasi Hill is a self confessed “style chameleon” and a street style staple so it was only going to be a matter of time before she ventured down the capsule collection path. Her seven-piece capsule collection for Lane Crawford launched this week in the Hong Kong store and is also available online at LaneCrawford.com with international shipping. I love the vivid abstract floral print pieces, the trousers are pictured below. Wanted: Up and coming fashion designers. Twenty Twenty TV are looking for new, up and coming fashion designers for their new TV show. I can’t say too much about it but what I can tell you is the you will be designing outfits for some massive stars and be mentored by some of the most respected names in the industry. The ten week competition starts in spring 2012, and auditions will be held all over the country at the end of January. If you think you’ve got what it takes and want to find out more please email applications@twentytwenty.tv or call 0207 4247715. Not sure how I feel about image printed bags just yet. I love the colours in that Taylor Tomasi Hill one, but I suppose i'd get a bit stuck at how to dress up around it. I'm thinking lots of neutrals, dark skinny jeans and a soft cream blouse?